CHANGWON, South Korea, Nov 1 2011 (IPS) - Berlin is a big capital city of a country famed for making excellent automobiles, but it can no longer afford roads and is now moving people by transit, bike and especially through walking. Berlin is not alone. Paris, Tokyo, Seoul, Bogotá, New York City and other major cities simply cannot afford the cost, the pollution, the noise and the congestion of more cars. They are embracing a new concept called EcoMobility – mobility without private cars. “EcoMobility is not only walking, cycling and public transportation. 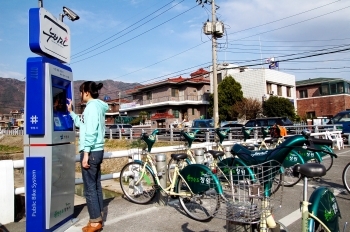 It is about these three systems clicking together: connectivity is the key,” Gil Peñalosa, former director of parks and recreation in Bogotá, Colombia, told those attending the EcoMobility Changwon 2011 congress. The congress on Mobility for the Future of Sustainable Cities was organised by the South Korean city of Changwon and ICLEI – Local Governments for Sustainability, an association of local government members from more than 1,220 cities in 70 countries. “The famous Times Square in New York City is now a permanent pedestrian mall. Who would have believed that could happen just three years ago?” Peñalosa commented to Tierramérica. “Five years ago who would have thought Paris would have over 22,000 bikes as part of a tremendously successful bike sharing system?” added Peñalosa, who is now the executive director of 8-80 Cities, an NGO based in Toronto that promotes walking, cycling, parks and urban trails to improve the public life of cities. “We need to build cities around people and not around cars,” he stressed. EcoMobility is defined as moving people and goods in urban areas using combinations of walking, cycling (including electric bikes) and wheeling (roller blades), public transport, and light electric vehicles. The concept is being widely embraced by cities looking for affordable and effective forms of sustainable transport. “Cities should focus more on moving people rather than moving vehicles,” said Stephen Yarwood, mayor of Adelaide, Australia. The fact is, cars are not very good at moving people. A standard 3.5-meter-wide city street has a maximum capacity of 2,000 people in cars per hour. The same road can carry 14,000 cyclists or 19,000 pedestrians each hour. Light rail in the same space can move 22,000 people, and a double lane of bus rapid transit will move 43,000 people, said Manfred Breithaupt, director of the GIZ Sustainable Urban Transport Project, a German NGO. The transportation sector is one of biggest contributors of carbon dioxide to the atmosphere, responsible for 25 to 30 percent of the emissions causing climate change. Cars and scooters are by far the biggest sources of carbon dioxide on a per-kilometre, per-person basis, said Breithaupt. Cycling or walking produces no greenhouse gases at all. Moving people out of cars is an enormous challenge. One major reason is the endless multi-billion-dollar advertising by automobile companies telling people that buying a car is the ticket to success, freedom, status and other nonsense, said Peñalosa. “Car companies attack transit with their commercials. Someone told me that in their country, one advertisement suggests people using subways have some kind of ‘subway stink’,” he said. In North America the cost of owning and operating a private automobile amounts to 8,000 to 12,000 dollars a year, according to automobile clubs. That can be 25 to 50 percent of the average family’s after-tax income, illustrating the success of automobile advertising. “How else could we be spending 20 times more than we need to get around?” wondered Peñalosa. This is changing in Germany. “More than 80 percent of young people don’t think they need private cars,” said Bernhard Ensink, secretary general of the European Cyclists’ Federation, an NGO based in Brussels. Car ownership in Germany and other European countries is slowly declining, he said, because there are cheaper and easier ways to get around. Among those impacts are accidents where cars kill and injure thousands of pedestrians and cyclists every day. In fact, car accidents are the primary cause of death for young people aged 15 to 29 years worldwide. But shifting to an EcoMobility focus is difficult, said Yeom Tae-Young, mayor of the city of Suwon outside of Seoul, Korea. “Citizens must know about EcoMobility and the government’s commitment must be clear,” he told the congress participants. Suwon, an ancient city with just over a million inhabitants, is competing with Changwon to become South Korea’s greenest and lowest-carbon city. Not all people will agree, and there will be inconveniences, but the public will still support the changes if they understand it is for the greater good. “We cannot close our eyes to the challenge of climate change,” he concluded.